Conquer the seven seas as a fearsome pirate lord who wields a custom LARP cutlass when you create your unique blade with the DIY LARP Cutlass Handle - Painted! Both beginner DIY LARPers and pros will agree this is an incredible buy! Made from a durable polyurethane foam cast, this realistic LARP sword handle is crafted and pre-painted to resemble a D-guard cutlass hilt with a wooden grip. The guard has been painted to resemble aged brass and the grip possesses a wooden grain. Its durable construction is completely safe to use in LARPing events and has been approved by the top LARPing organizations. It also requires virtually no maintenance and will last longer than regular foam latex handles. 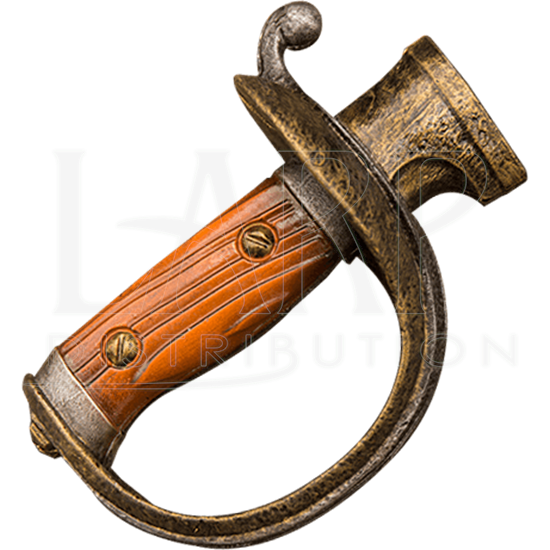 Establish yourself as the most ruthless pirate on the seas when you build your sword using this handle!